Kyushu is full of charms including hot springs, nature and delicious food. It seems that the number of foreign tourists visiting all the parts of Kyushu is increasing in recent years thanks to spreading LCC and the opening of Kyushu Shinkansen, etc. Besides, Japan, even referred in a word, has different characteristics depending on regions. It is said that foreigners often feel Kyushu as an exotic place. We introduce events by which you can enjoy such Kyushu. While walking in the town of Yufuin, you can hear the sound of horse hooves. It is a sound of horse-drawn carriages. 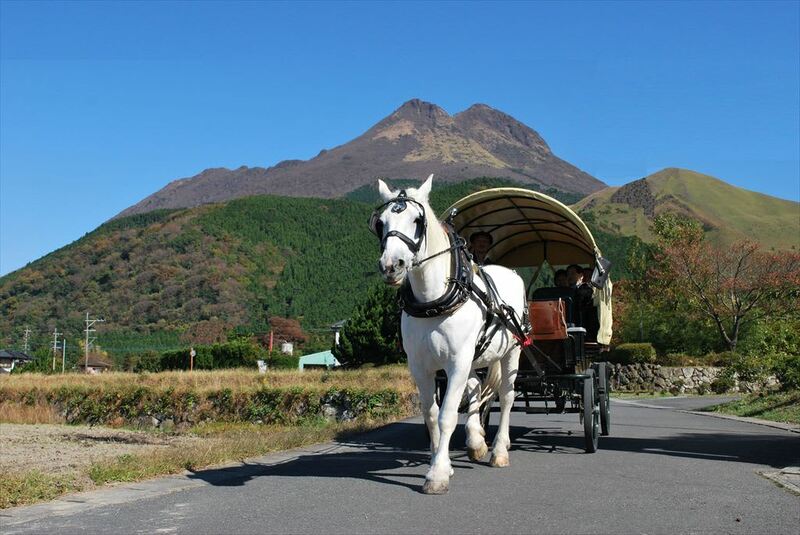 Sightseeing horse-drawn carriages began more than 30 years ago, and now they are one of the famous attractions of Yufuin sightseeing. Today the sightseeing horse-drawn carriages are a symbol of Yufuin Onsen (hot spring resort) but their birth had a background. Due to rumors-caused damages when the earthquake in Oita Prefecture occurred in 1975, the number of people visiting Yufuin Onsen abruptly decreased. So as to get out of such a crisis situation, people of Yufuin struggled holding a music festival, a film festival, a screaming competition after eating beef. The sightseeing horse-drawn carriage was one of such measures. The horse-drawn carriages traveling around an ordinary city are rare in Japan and have gained popularity nationwide. The sightseeing horse-drawn carriage course starts from the spot in front of JR Yufuin Station, gets through Bussanji Temple and Unaguhime Shrine and comes back to Yufuin Station. It takes about 50 minutes. Bussanji Temple through which the course runs is a temple of Rinzai sect built in the Heian period and has been popular as a mountain faith place for Mt.Yufu from ancient times. The temple has Hondo (main hall) with a copper plate roof, Kannon-do (temple dedicated to Kannon) built of cypress, and also Kuri (priests’ living space) and Zazen-do (temple for performing Zazen) using cedar. Unaguhime Shrine is also known as “Rokusho-Gu”. Rokusho means six deified gods. In the precincts having an area of approximately 20 thousand square meters, there are three stumps, which include one of a few hundred year old sacred tree, surrounding the red Haiden (front shrine) and Kagura-den (stage for dedicating a dance and music to the god). One of the charms of the sightseeing horse-drawn carriage is to enjoy the history and buildings of Yufuin. Out of service even in the business time when the weather is rainy or the horses are sick. ※ 1,200 yen for people of 4 years and upwards. 1,200 yen is required even for a child under 4 years, if one seat is needed. Yumeginga is the Saga Prefectural Space Science Hall, a science hall mainly exhibiting space-related matters in Takeo City, Saga Prefecture. An exhibition: “Science in summer festivals” is held here in the summer vacation. Speaking of summer, summer festivals are essential. Exciting attractions of “summer festivals” such as goldfish scooping, ball scooping, fireworks and cotton candy are described from the perspective of a space science museum. For example, the corner of science of yakitori (grilled chicken) explains the name of yakitori, how to grill delicious yakitori. In the exhibition reproducing a summer festival by actually stalling food and attraction stands in the exhibition hall, things essential to summer festivals including goldfish, beer, drums, squid grill are explained scientifically. Participatory fireworks are also shot off in the special gigantic screen combining the latest digital technology and realistic sounds and will liven up the summer vacation feeling. “Summer research assignment dojo” held at the manufacturing studio (about 60 seats) waits for participants along with twelve themes of handcrafts. For example, you can enjoy “ticktack marbles” (100 yen), a collision experiment device using marbles, “pneumatic gun” made with plastic bottles and balloons (100 yen) and various other working kits. You can also receive advice on the summer research assignment. The subject is not limited to children and anyone will be welcome. Why don’t you experience it going back to your childhood in mind? This is a science museum located at Aburagi-machi, Nagasaki-shi, Nagasaki Prefecture mainly focusing on earth science and astronomy. Also called as Starship. It is a facility which introduces science, universe and the nature of Nagasaki under the theme: “From Nagasaki to the earth, and to the universe”. The museum has a planetarium, renewal-opened in March 2014. Optical projector Chiron II certified as the “most advanced planetarium” by Guinness World Record has been introduced. You can enjoy realistic beautiful starry sky by high-brightness LED light sources that enable projection of about 140 million stars. At Nagasaki City Science Museum where you can enjoy science while having fun, “Earth Mother of Life — Great Amazon Exhibition” will be held. Amazon full of mysterious creatures. Diversity of creatures adapted to the environment are living in Amazon. 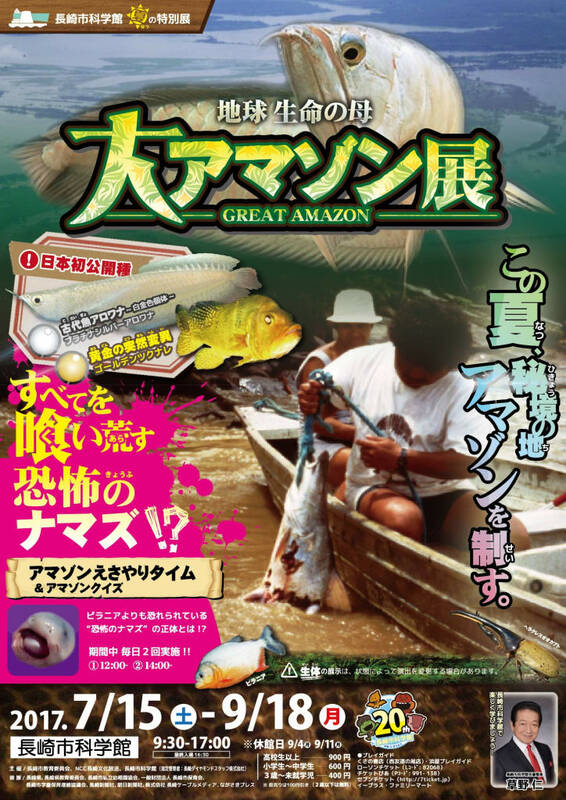 In the special exhibition, scaring catfish that is more feared than Piranha, species first exhibited to the public in Japan, dangerous fish inhabited in Amazon, rare fish, beautiful fish, gigantic insects, etc. are exhibited. Especially in the zone of creatures unveiled for the first time in Japan, you can see various creatures that you have never seen before. There must be encounters with mysterious creatures full of mystery in this special exhibition. You can see interesting catfish feeding time every day (12:00 to, 14:00) during the exhibition period. Let’s go and see mysterious creatures living in Amazon, a secluded land, such as “ancient fish arowana” and “golden tucunare” by all means. “Yamanokuchi Dondon Festival” held in the town of Yamanokuchi, Miyakonojo-shi. Miyakonojo-shi where the festival is held is a town located at the southwest end of Miyazaki Prefecture. This is also the city with the second largest population in Miyazaki Prefecture following Miyazaki City. The name Miyakonojo is derived from Miyakonojo (Miyako Castle) constructed by Yoshihisa Hongo. Various stage events including brass and musical performances, folk performing arts, Takagi Wrestling, Warlord Yamagoro Taiko, Dance Contest, Rope Jumping Tournament are held at the Yamunokuchi Athletic Park, the venue of the festival, from the afternoon of the day. 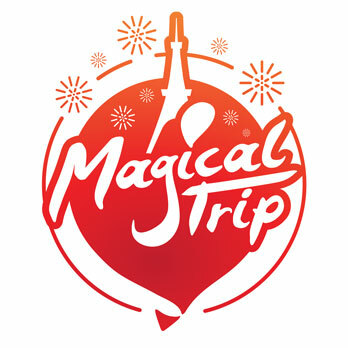 Enjoyable events like a grand raffle draw where participants in stamp rally around shops in the town may win luxurious prizes are also held, and the venue is crowded with a number of people. Approximately 5000 fireworks liven up the finale of the festival. The fireworks that can be seen near the venue are so spectacular that the spectators burst into cheers. The theme of the fireworks display of this year is “smile”. In addition to Star Mines successively launched in large quantities using fast fire rays in a short time, continuous small smoke fires, message fireworks, music fireworks and so on are launched one after another, and colorfully light up the night sky. ※ In the case of rainy weather: events will be held in light rain but postponed to the next day in heavy weather. ※ On the day, free shuttle bus service from JR Yamanokuchi Station is planned. Aya Fireworks Display held at the riverbed upstream from Sanbonmatsu Bridge of Ayaminamigawa River. This is the 37th festival. Speaking of Aya-machi, the origin of the town is old. Because Jomon ruins are found in Otachi district of the central tableland, it is supposed that people also lived in this region in that period. In addition, Aya Ancient Station was described in governmental regulations compiled in the middle of the Heian period, and a settlement was formed in the Nara period. The settlement became Aya-mura in 1889, and became Aya-machi through the implementation of the municipal organization in 1932, up to the present date. The fireworks display is held in mid September every year. The sound of the fireworks echoing in the clear night sky roars in the mountains, and the Shaku-dama fireworks nearly cover the sky and attract the spectators. The fireworks launched include Star Mines, shaping fireworks, music fireworks and fireworks, about 4000 shots in total. 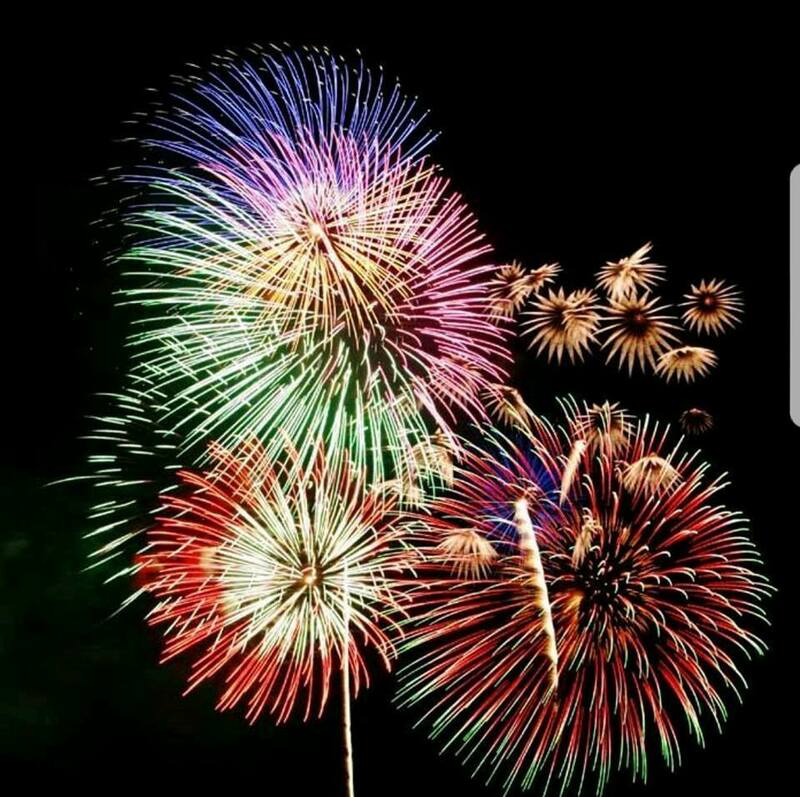 The fireworks reflected on the river surface are also beautiful, the sound of the fireworks roars in the mountains, it is a compelling fireworks display weaving the light and sound. Let’s travel and see the fireworks held at the end of the summer in a serene low upland area of beautiful scenery in the bosom of the Kyushu Mountain Range, which is surrounded by the Ayakitakawa River and the Ayanamigawa River, tributary to the Oyodo River. ※ The event will be postponed to the next day when the weather is rainy. “Ibusuki Onsen Festival”, which appreciates the abundant hot springs and the blessings of the earth, is held with the Central Park Ibusuki as the main site. The Ibusuki Onsen Festival is a historic festival that began shortly after the World War II. In the festival, people visit Yu Gongen Jinja next to Goten Yu, thank the grace of hot springs, and pray so that the hot spring source will not run out. Various events will be held including Hanya dance on the first day of the festival and Mikoshi Togyo (transferal of a portable shrine) on the second day. Guest stages and performances by citizens are performed, and there are lots of fun like raffle draws where participants may receive presents, and open public baths discounted to 100 yen (free of charge for children of elementary school age and younger). It is a festival loved by many citizens as a big summer event in Ibusuki. The fireworks display is held for the finale of Ibusuki Onsen Festival. 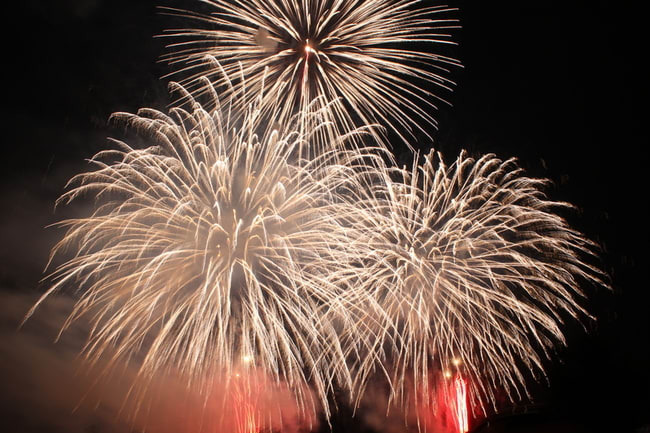 In the fireworks display, about 5000 fireworks (planned) will be launched from breakwaters along the Kagoshima Bay. Particularly, panoramic fireworks going up as if wrapping around the night sky and the spectator are compelling and must-see spreading across the sky. You can reach a point of selflessness forgetting everyday life by watching a beautiful contrast between the night sky and the sea stained in the darkness. In this season when the heat is still continuing, why not empty your mind and forget the heat by watching the fireworks that sprinkle in the sky? 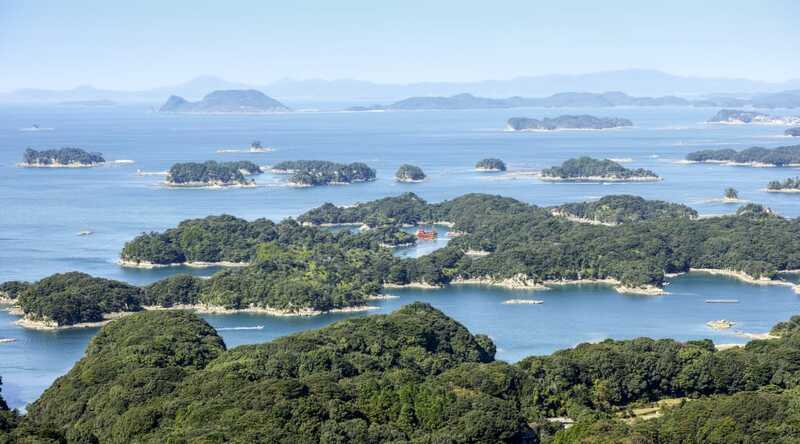 “Kujukushima Enjoyable Month” will be held again this year in Kujukushima with the blue sea and beautiful green plants and full of creatures. Kujukushima is a sea resort park at the entrance, a sea area dotted with large and small 208 islands over 25 km north from the outside of Sasebo Port. It is said that the island density is the best in Japan. On these islands, you can meet friendly dolphins at “Kujukushima Aquarium Umi Kirara”, and enjoy the experience of pleasure boats travelling around the islands, yacht sailing, sea walking on a sea kayak. The event of this year has plenty of contents for fully enjoying Kujukushima as a ‘Kujukushima Day’ memorial event, for example, “Sunset Live Cruise” in which you can enjoy music and cruising while watching the sunset, “Yoga Kirara”, Yoga class early in the morning held in front of water tanks of the aquarium before opening, and two day limited “Night Aquarium”. After enjoying the event, also recommended is spending time in the seafood market in the Pearl Sea Resort, shopping facilities selling miscellaneous goods and so on and restaurants where you can taste seasonal seafood and sweets full of resort feeling. Try and enjoy resort feeling in Nagasaki while feeling the refreshing wind from the sea. Date and time vary depending on the events. Reservation may be necessary when there is a limitation on the target and number of the participants. Kirishima is blessed with magnificent nature of Kirishima Mountain Range designated as a national park for the first time in Japan, and with hot springs gushing from their feet. It is said that the origin of the name of “Kirishima” is “an island floating in the mist” viewed from the heavenly world. Famous mountains of Kirishima Mountain Range are colored by nature, myths, legends, and allow you to feel the dynamism of the breath of the volcanos just before your eyes. Clean flows full of active feeling show mysterious looks in season by season and their natural beauty will even move your heart. Kirishima is full of nature’s blessings such as hot springs which are one of the most popular ones in Japan, Fukuyama black vinegar aged by traditional manufacturing method, Kirishima tea with rich incense and taste, shochu made from sweet potato grown in Shirasu earth, product of volcanic activity. Besides the blessings of nature, folk performing arts are also flourishing. 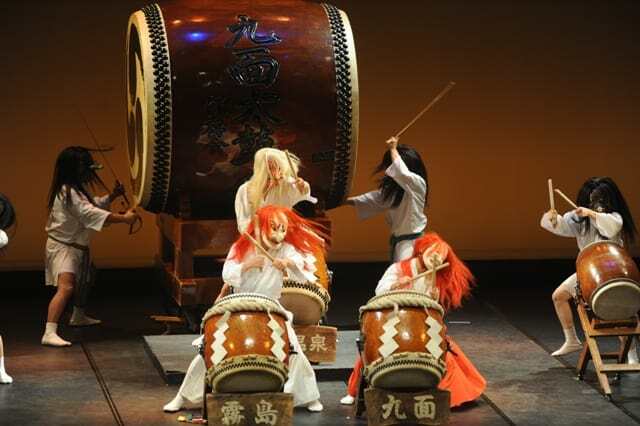 Kirishima’s folk performing arts include Kirishima Kumen Daiko and Kirishima Kagura. Among them, Kirishima Kumen Daiko is local folk art drums that are majestic and brave and played and dedicated in Kirishima Shrine on New Year’s Day every year. Evening of the Kirishima folk performing arts will be held at Kirishima International Music Hall (Miyama Concert) as the venue. This is a music specialty hall where you can experience the rich echo of acoustic sounds that cannot be tasted in the other halls and is called “miracle sound” by the International Acoustical Society. Since the Kirishima International Music Hall (Miyama Concert) recognized by the International Acoustical Society is the venue, drum sounds and dances are impressive full marks. The performer, Tenson Korin Kirishima Kumen Daiko Preservation Society, has performed extensively in many overseas performances as well as domestic performances. This is a chance to watch closely “Kirishima Kumen Daiko” and “Kirishima Kagura”, folk performing arts, in Kirishima, the land of the mythology “Tenson Korin”. When you watch them, you may feel the flow of eternal time and the great blessings of nature. Kumamoto City Contemporary Art Museum was opened as the first contemporary art museum in Kyushu. It is built not only for the sake of knowledge and culture but also as a place like a house where you can be energized just by visiting. In addition to the major works of a painter of Western paints from Kumamoto, Nobumichi Ide, works of international artists such as James Turrell and Yayoi Kusama are exhibited in free space. The museum has a home gallery full of books such as art books and kids saloon where children can play available for free, making it a place for citizens to relax. 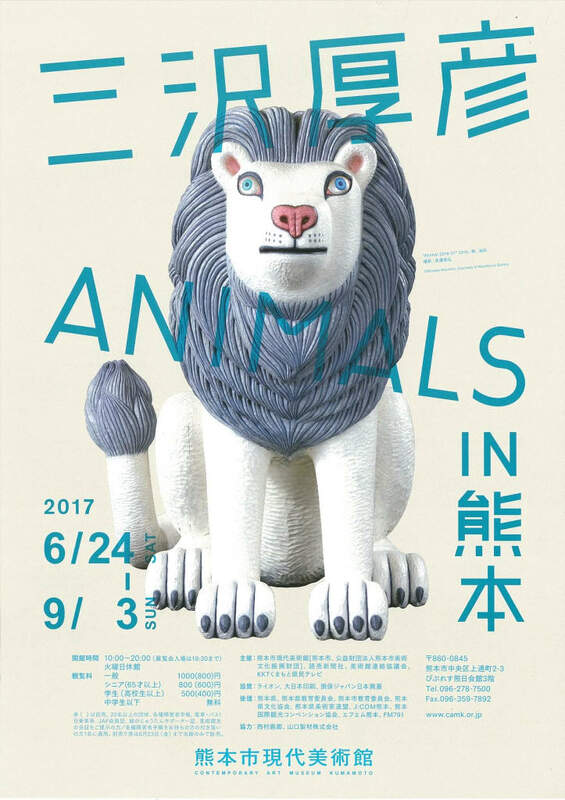 At the Kumamoto City Contemporary Art Museum, an exhibition introducing the masterpiece “Animals” by a Japan’s representing contemporary sculptor, Mr. Atsuhiko Misawa will be held. “Animals” whose production was started from 2000 are masterpiece of Misawa with animals as a motif. The works with life-sizes are sculpted from logs of Kusunoki with powerful chisel marks and colored with oil paints. The motifs cover familiar ones like cats and dogs and big ones and imaginary creatures like large bears, elephants, Pegasus. At the exhibition, mainly about 100 items of sculpture works and paintings, including the latest works, will be exhibited along with a reproduced atelier corner. Let’s meet the animals that Misawa produces that have an overwhelming presence and attracting expression which stimulates the feelings of the audience. The Kumamoto Prefectural Museum of Art is located in Kinomoto Castle Ninomaru Park and a museum surrounded by green plants with a relaxed atmosphere. It exhibits Kumamoto-related antique art and contemporary art, decorative ancient chamber, Western paintings such as Renoir and Pascin, and works by Tomoaki Hamada, a world-famous print artist. 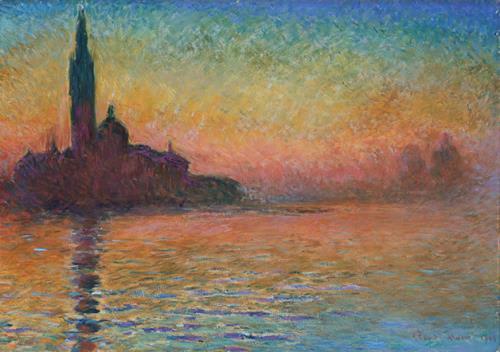 At the museum, an exhibition entitled “From Turner to Monet; Treasures of the UK Collection of the Welsh National Art Museum” will be held this time. Approximately 90 works gathered from the National Museum of Welsh, which has a large collection of world-famous paintings will be exhibited. From the collection of the Welsh National Art Museum, over 70 works by painters who were active in the UK and France during the early 19th and 20th century are exhibited. Starting with Turner, a representative landscape painter in the UK, works by realist painters such as Millet and Courbet, and works by Monet and Impressionist masters will be exhibited. At the exhibition, transition of art in both countries for about 100 years from the 19th century to the beginning of the 20th century will be followed. It is also interesting to see the interactions among the artists, the way they opened up and differences in their personality. This exhibition will be one of the most fulfilling Western painting exhibitions in Kyushu. Let’s love masterpieces that can be rarely watched by visiting the Kumamoto Prefectural Art Museum and Kumamoto Castle that is now under reconstruction. Also occasionally closed due to the fumigation work of the storage cabinets and change of exhibited works.